I spend a lot of time in my home office. I love my little lair where rarely anyone treads aside from me and the cat. I like it to look pretty and to be comfortable. Pretty much how I would like my office attire to look (if I was going to an office), but there are always times when you need to dress for a meeting or work even if you aren’t going to a conventional workplace everyday. 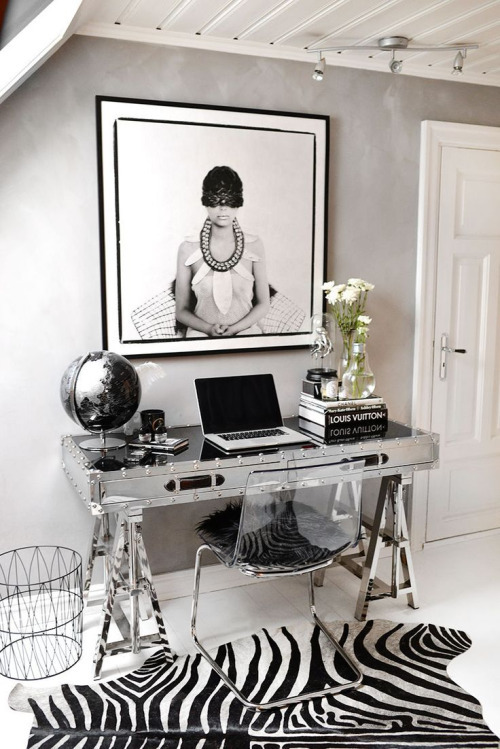 Below some inspiration for our home offices as well as our work (or meeting) clothes. I love this combo of classic grey dress with an edgy leather jacket and oversized pearls. The pop of colour with the clutch is fun too. This is a great simple black on black work look worn by Victoria Beckham. This mix of navy dress with neutral accessories of brown boots and grey handbag modernizes a tried and true work look. This classic black & white outfit is updated with a graphic print on the top and the beaded collar worn with an oversized bag. This is a great look if your office allows for a smart casual dress code. Super simple, but professional. This home office is a real space for the girls! 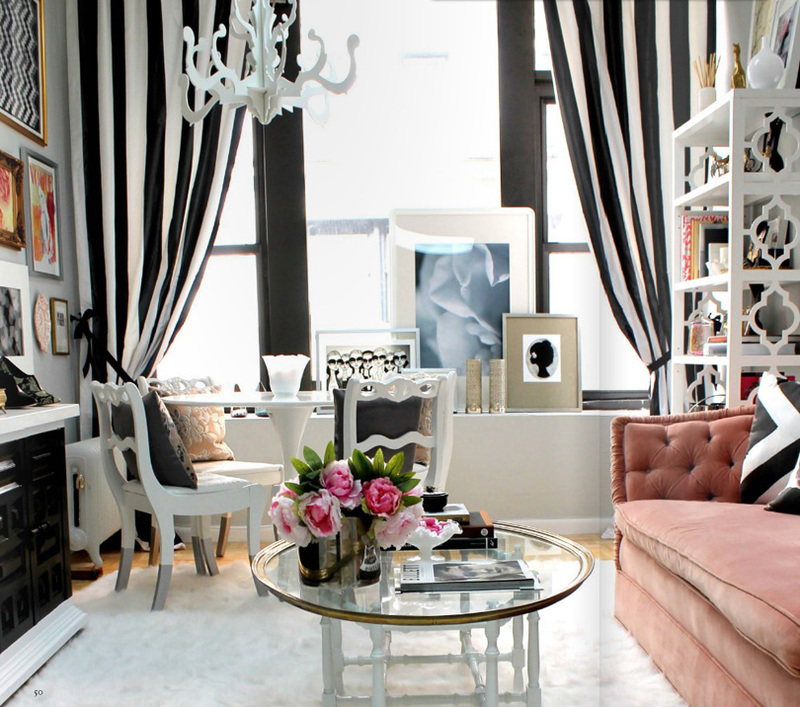 There are lots of feminine shapes here, but the black accents keep the scheme grounded and adds drama to the room. 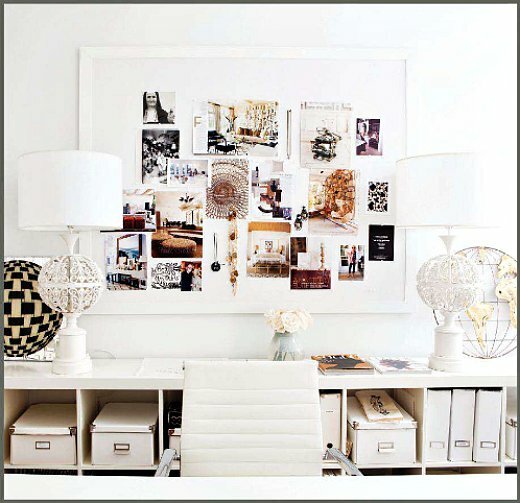 This white on white office is very chic. Lots of interest added with the constantly changing mood board. Having it in a frame makes it more special and contains the visual busyness of it. This is great use of a corner space for a home office. The navy, grey and white colour pallet is really sophisticated with a pop of yellow. If you read my blog regularly, you will probably know that I love the look of natural wood mixed with black accessories. Add a hit of grey, as below, and you have a magic combination. The huge pendant lights are a cool play on scale. This is also a good solution for a home office if you are short on space. The metallics reflect light around the room, which helps with the feeling of space. And the mix of black and metallics and that gorgeous black and white picture against the textured grey wall is just gorgeous! What is your favourite office look? Do you have room for a home office? Is it a corner or do you have space for a dedicated room?